Manchester United’s players took the applause of Old Trafford – but it was acknowledgment of a plucky effort rather than praise for any serious quality. And the frustration for the Premier League side will be that this should be regarded as a missed opportunity because Barcelona were light years away from their flowing best here. Solskjaer and his side are left hoping for the same sort of miracle that saw them overcome a 2-0 home defeat to come through the last 16 against PSG – but lightning does not usually strike twice, Barcelona are a superior side and the Red Devils have won only once in the Nou Camp, when they beat Bayern Munich there in the 1999 Champions League final. United will summon up those spirits but this is very much odds against once more. Barcelona have glittered in the Champions League for years. This was a night for the grind and they got the job done. It was undistinguished, unspectacular, but done all the same. 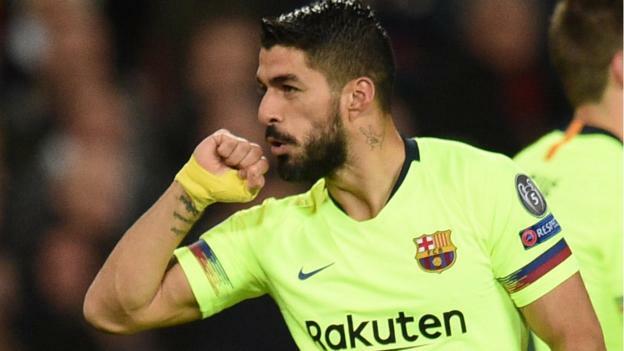 Suarez got his goal but was only an intermittent threat while Messi occasionally flashed but was often on the margins, not helped by sustaining a facial injury in a first-half challenge by Chris Smalling. Coutinho showed glimpses of the brilliance that made him such a precious commodity but this was a night when Barcelona played well within themselves. There was little in the way of celebration from their players at the final whistle as they knew their performance was poor but it was still a giant stride towards the semi-final, and they will be satisfied by how they totally nullified United. Manchester United manager Ole Gunnar Solskjaer: “There were pluses and negatives. We started sloppy and a bit nervous. After their goal we settled and played well. “We had very good individual performances in midfield. At times it felt like a proper United team – the crowd were behind us, we got out wide and got crosses in. Former United and current Barcelona defender Gerard Pique: “After seeing the PSG game, you do not have to trust the result – they came in Paris with a better result and look what happened. Big clubs can do these things, you have to work it out. Manchester United have lost three consecutive home Champions League knockout stage games for the first time. This was Barcelona’s fourth Champions League victory against Manchester United, with each one coming in a different stadium (Nou Camp, Stadio Olimpico, Wembley and Old Trafford). Manchester United have lost four of their past six Champions League home games, as many as they had in their previous 71 at Old Trafford in the competition (W51 D16 L4). Manchester United failed to have a single shot on target in a Champions League game for the first time since March 2005, in a 1-0 loss at AC Milan. Barcelona have won five of their past seven away games against English opponents in the Champions League (D1 L1), as many as they had in their first 17 such games in the competition (W5 D5 L7). 36% of Manchester United’s total home defeats in the Champions League have been against Spanish opponents (5/14). Luke Shaw’s own goal was the eighth Manchester United have scored in the Champions League – no side has conceded more in the history of the competition. Luis Suarez has had more shots without finding the net than any other player in the Champions League this season (33).